Add a gentle contrastThe lush planting of this wild garden is very gently punctuated by a blue painted bench in the distance. It creates a soft focal point amid all the green without jumping out at you, and perfectly suits the rambling, relaxed feel of this outdoor space. Create a clearing under some treesIt seems obvious, but look around you and make the most of what you’ve got. If a clump of trees in your garden forms a natural canopy, clear an area underneath for picnics. It’s quick, and it won’t cost you a penny! Claudia De Yong Garden Design added this to Ask a Garden Designer: How Do I Create a Wildlife Haven? Keep it simple A mown path through a wooded patch and a sprinkling of cow parsley can be all you need, as this inviting garden shows. I love the idea of sitting here surrounded by wildlife and fruit trees in the dappled shade. Just perfect.TELL US…How do you cultivate your garden? Tell us in the Comments below. Love blue bench against all the green. Lower hang out area? Wild flower could look good around trees at bottom of garden. Low maintenance and a cost effective planting solution. Ah yeah...a backyard I'd love to have any day! Ha! A beautiful mowed path. So simple, and easy to maintain since there are no edges that have to be weed-whacked. Bench. 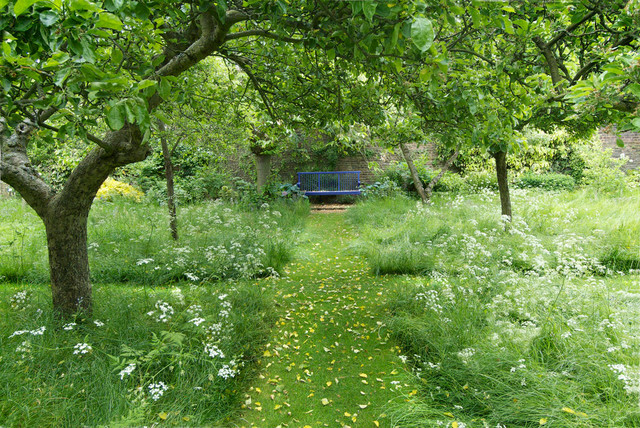 The treatment of the grass in this orchard is a great example of how changing mowing patterns can create a meadow lawn. The paths are still closely cut while the squares under the trees have converted to meadow, with an abundance of flowering grasses and the lacy flowers of cow parsley (Anthriscus sylvestris).